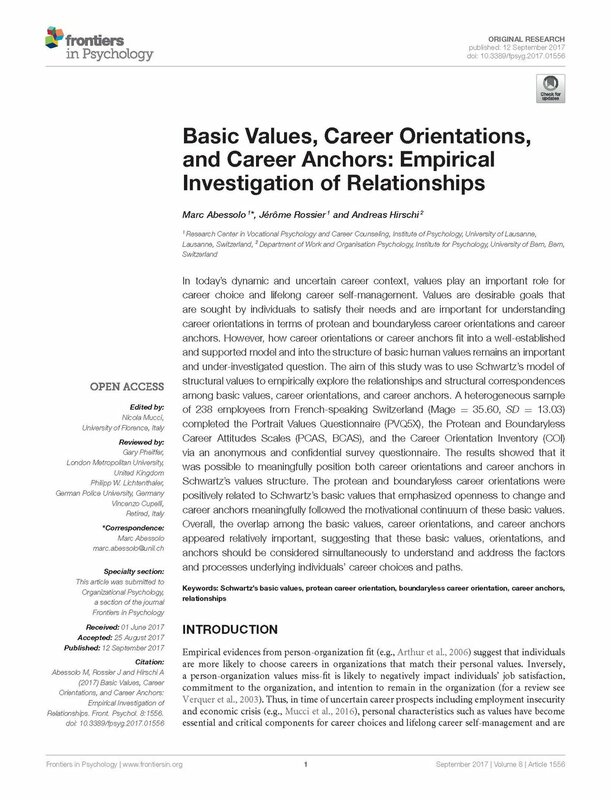 Basic values, career orientations, and career anchors: Empirical investigation of relationships. Abessolo, M., Rossier, J., & Hirschi. A. (2017). Basic values, career orientations, and career anchors: Empirical investigation of relationships. Frontiers in Psychology, 8(1556). doi: 10.3389/fpsyg.2017.01556. In today’s dynamic and uncertain career context, values play an important role for career choice and lifelong career self-management. Values are desirable goals that are sought by individuals to satisfy their needs and are important for understanding career orientations in terms of protean and boundaryless career orientations and career anchors. However, how career orientations or career anchors fit into a well-established and supported model and into the structure of basic human values remains an important and under-investigated question. The aim of this study was to use Schwartz’s model of structural values to empirically explore the relationships and structural correspondences among basic values, career orientations, and career anchors. A heterogeneous sample of 238 employees from French-speaking Switzerland (Mage = 35.60, SD = 13.03) completed the Portrait Values Questionnaire (PVQ5X), the Protean and Boundaryless Career Attitudes Scales (PCAS, BCAS), and the Career Orientation Inventory (COI) via an anonymous and confidential survey questionnaire. The results showed that it was possible to meaningfully position both career orientations and career anchors in Schwartz’s values structure. The protean and boundaryless career orientations were positively related to Schwartz’s basic values that emphasized openness to change and career anchors and meaningfully followed the motivational continuum of these basic values. Overall, the overlap among the basic values, career orientations, and career anchors appeared relatively important, suggesting that these basic values, orientations and anchors should be considered simultaneously to understand and address the factors and processes underlying individuals’ career choices and paths.